Nearly a decade ago, William Kolong came to Canada – one of the famous ‘Lost Boys of Sudan.’, a group of over 20,000 boys of who were displaced during the Second Sudanese Civil War (1983–2005) and walked to refugee camps in Ethiopia and Kenya. Countless numbers died along the way due to starvation, dehydration, sickness and disease, some being killed by wild animals or enemy soldiers – but William survived. Years later, William was sponsored as a refugee and came to Canada, where he landed a job on a maintenance crew at Metropolis mall (Metrotown). It was during this time that he met and was supported by Pastor Hergesheimer at Collingwood’s First Lutheran Church. William also became close friends with the family, including the two Hergesheimer brothers, Josh and Chris. The brothers in South Sudan. Food Systems. After much thought, he decided to shut down the Flour Peddler. But after the urging of his brother, Josh, Chris was convinced to “go out with a bang?” as Josh put it. The brothers decided to take William up on his offer. By that time William had moved back to his home village in the newly formed country of South Sudan. The brothers were able to get William on the phone to tell him that they wanted to come and build a bike-mill there. William agreed, and so the brother set out raising money by selling bags of flour and organizing a crowdfunding campaign. And so in December 2013, they set off with two grain mills and a box full of bike parts – but with no blueprints for how they would build the machine. They had a tip on where they could get help—a Technical school metal shop in a town 800 miles away from their final destination. VANCOUVER AIKIKAI Aikido is a martial art that emphasizes self-defense and character development through the practice of blending and redirection rather than head-on conflict. Vancouver Aikikai, affiliated with the International Aikido Federation, offers a safe, friendly and expert environment for studying Aikido. Try-out classes are free. Beginners, advanced and weapons classes are taught by Aikido World Headquarters-certified instructors. Our dojo is located in the Renfrew Community Center at 2929 E 22nd Ave in Vancouver. For more information, call 604.802.4853 or visit VancouverAikikai.com. talking with new people, and starting conversations about opportunities through CNH and other agencies and community groups. From approaching businesses to providing information pamphlets, Di truly values the importance of getting to know and build a connection with other community members. Di also enjoys baking cookies and going for walks around the neighbourhood. She has met many new friends, and has increased self-confidence through her volunteer experience. Di has built upon new skills which she’ll carry with her, throughout life. Annie Lai is a grade 12 student currently enrolled in the Leadership Mini School Program at Windermere Secondary and is involved with INTERactive as a connector. Full-time | Part-time | Online Contact a program adviser to apply. Special thanks to all the volunteers for another great community festival! We want to hear from you! Yes, You! Send comments, community events, press releases by regular post, fax or e-mail. Suggestions for improving the paper are welcome. We welcome appropriate, unsolicited editorial submissions if accompanied by the author’s real name, address and telephone number. The author should retain the original as we cannot return submissions without prior agreement nor does submission guarantee publication. We reserve the right to make editorial changes. Next submission deadline: May 10 The Renfrew/Collingwood Community News is an initiative of the Collingwood Neighbourhood House (CNH). Yo u C a n F i n d t h e RC Community News @ Libraries, Collingwood Neighbourhood House, Renfrew Park Community Centre, The Italian Cultural Centre, Collingwood Policing Office, other organizations, religious institutions, schools, laundromats, Starbucks, Rona, Superstore, Canadian Tire, Walmart, London Drugs and Safeway coffee shops, restaurants, markets, corner stores, other businesses, and coffee tables all over Renfrew-Collingwood. Spring time is not only the time of year to tidy up your living space but also an opportunity to clean up your job search strategy. By sprucing up your job search approach you can increase the amount of job opportunities to come your way. 1. Clean up your resume Checking your resume to catch any mistakes is important when job searching. The smallest mistake can cost you an interview. Review your resume several times for correct punctuation and word use. Before you send it to an employer ask a friend who has good English skills to check for any mistakes you may have missed. It is also important to ensure that your resume is properly formatted, with a preferred font size of 11 or 12 point but no less than 10 point. Be sure to use a professional font, either Arial or Times New Roman, and ensure it is consistent throughout your entire resume. A standard resume is one or two pages in length. Remember be concise and only include relevant work experience for the position you are apply for. Finally, it is important to ensure that all your information is up to date including making sure that all certificates such as first aid are current and have not expired. Ensure that you are posting appropriate content, including the photos that you or others post of you. Avoid being too vocal about your viewpoints; your viewpoints could be another red flag for hiring managers who do not agree with them. Be mindful about the amount of information you are sharing. Telling everyone every little thing you are doing, thinking, reading, watching and listening to can be a big problem, even for the non-job seeker. Not only are your friends and family on your social networks, your future coworkers and supervisors will be there, too. 3. Tidy up your online presence Did you know that many employers these days Google candidates before making a hiring decision? Social media is not only a job-search tool, it is also something recruiters and hiring managers use to qualify or disqualify candidates. That’s why there are a few things to consider when you are using social media sites. 2. Restock your network It’s not always what you know but who you know. EVERYONE you know is part of your network, including friends, family, professors, instructors and coaches. For every person you make a connection with, remember that they have access to others with potential job leads. Take a look at your contact lists and clear out those who you have lost touch with to make room for new contacts. Services Centre provides employer presentations and hiring fairs that will allow you to expand your network. Join Us For Mother's Day Traditional Italian and Greek Food We cater to groups of up to 120 people. Open for lunch: Weds/Thurs/Fri from 11:00am Open for dinner: Everyday from 4:00pm . artists who are seriously considering a career in the theatre. #116 - 2800 E1st Ave.
Coastal City Ballet performs the world premiere of Cinderella on May 15 at Centennial Theatre in North Vancouver and May 30 at the Surrey Arts Centre. One of the most enduring and beloved tales in the world, Ana Paula Oioli as Irene Schneider’s Cinderella. Photo courtesy Cinderella will of Coastal City Ballet showcase the ballet company’s diverse talents. In collaboration with the City of Burnaby, Still Moon Arts Society once again brings you an opportunity to get to know the Still Creek area! The historic tour of Upper Still Creek will be by foot and Skytrain (cost of transit will be covered). It begins from the children’s playground on the northeast side of Swanguard Stadium in Central Park and ends at Still Creek near Grandview Highway. Tour participants will learn about the historical and ecological context of Upper Still Creek watershed and the return of salmon. Please register for this tour by contacting the Burnaby Planning Department at 604-294-7530 or planning@burnaby.ca. Vancouver Aboriginal Child and Family Services Society is seeking loving and dedicated foster parents who are willing to share their homes and provide foster care for Aboriginal babies, children, and youth in the Greater Vancouver area. We invite Aboriginal and non-Aboriginal applicants. Information Sessions are held on the 1st Tuesday of every month at 6:45pm in our office at 3284 East Broadway, Vancouver. For more information, please email foster@vacfss.com or call 604-216-7447. Art, Music, Performances, FREE FUN!! Heritage f air with a w h i m si c a l fla i r ! * 1:00 - 3:00 p.m. Shadow Puppet Workshop. WED. MAY 27 * Surprise visits by the Joyces on Joyce Heritage Performers. Watch for them throughout the neighbourhood! * 11 a.m. to 4 p.m. Collingwood Days Community Festival Day at Sir Guy Carlton Elementary, 3250 Kingsway. 9:00 a.m.- 11:00 a.m.* Pancake breakfast (by donation) 11:00 a.m. - 4:00 p.m.* Main Stage- Music and Dance all day! Opening blessing by Wes Nahanee Emcee - Lee Morin Featuring: The Highland Gong Society, Windermere School Choir, Jawani Ka Jhatka, The Zhang Dance Group and lots more FUN FUN FUN! * International Marketplace * Collingwood Heritage Pavilion * Kids Zone activities * Games * Food Court * Artisan Village * vancouver Police Horse Squad * BIA Raffle * Face Painting * Balloon Creations by Bent Air 2:00 p.m.* Watermelon Eating Contest * BMX Airshow 12:30 p.m.,1:30 p.m. and 2:30 p.m.
Collingwood Days recognizes and honours that the celebrations take place on the traditional territory of the Coast Salish People. presentations to various groups. He invites people to participate in CNH and helps match them to relevant programs and services. For example, he recently explained to ESL students how they can volunteer on CNH’s rooftop garden, take photos for CNH’s programs or help cook meals for the community kitchen. CNH also tries to match people with pathways to employment. It gives them opportunities to become involved in the community and Canadian culture, to receive mentoring, and to access volunteer opportunities to build capacity and job skills, which helps build confidence. Najia follows a less structured approach to outreach, but she is always focused on explaining CNH’s opportunities to newcomers. She starts conversations naturally, and if she senses that someone might benefit from CNH’s opportunities, she’ll tell them about CNH, no matter where she is. One day while in the sauna at the gym, she even explained to some local women how they could get a Neighbourhood Small Grant to improve their community! Crecien notes, “Other service providers typically focus on English and job search classes, but these sorts of classes aren’t sufficient to make newcomers feel integrated into or welcome in the community.” CNH draws its strengths from its network of community connections and the relationships it builds. Its approach creates a healthy, welcoming environment and leads to an improved integration process for newcomers. Crecien and Najia both believe in the importance of helping their neighbours and building community. Crecien values the connections he has made with members of the community, something that he’s reminded of when a senior he’s helped waves to him in the supermarket. It also makes him feel good when he can see in the community the results of the connections he’s helped create. Newcomers are invited to contact Najia or Crecien. They’re happy to help connect people with opportunities! Najia is strongly motivated to reach out to people who need help. She remembers how when she needed help, she didn’t get it at first. She wants to discover other newcomers’ talents, the same way CNH staff discovered her talents, and to connect people to opportunities for sharing their talents and improving their lives. What does CNH have to offer newcomers? In addition to providing settlement services, CNH satisfies newcomers’ needs for recreation, children’s, seniors, family and other programs and gives them a sense of belonging in the community. EVENT SCHEDULE FOR SATURDAY MAY 30TH 9:00 - 11:00 a.m. - Pancake Breakfast 11:00 - Opening Ceremonies 11:00 - International Marketplace, Food Court, Kid Zone - Presented by Vancity Credit Union, Artists Village & Heritage Pavilion open 11:30 - 4:00 p.m. - Main Stage Entertainment 12:30, 1:30 & 2:30p.m. - BMX AirShow performances - Presented by G&F Financial Roving performers throughout the event and a special appearance from the Vancouver Police Mounted Horse Unit. Better at Home is funded by the Government of British Columbia. with us and e n j o y a huge selectio n o f m e n u choices. Serving great h o m e cooked meals everyday. The Seniors Connection Join the Monday Fun Day at CNH by Kat Cureton Expect to see more fun programs and activities on Mondayafternoons at Collingwood Neighbourhood House (CNH). The Forever Young project is coming to an end but this is certainly not the end to exciting intergenerational and intercultural activities. A group of 25 seniors and program staff gathered at CNH on March 16 for a potluck and rousing discussion on new program ideas for Monday afternoons. For close Connie and Eliza invite you to celebrate monthly birthdays and to two decades, a group of seniors play bingo every first Monday of the month at Collingwood have been meeting at CNH for a variety of activities, trips and guest Neighbourhood House. speakers. Sadly several members of this original Seniors Welness So, the original group is very Centre and Collingwood Group have moved away, fallen ill pleased to swing the door wide Neighbourhood House or passed away, and in recent years open to anyone who wants to invite you to participate in the group has shrunk to under 10 join in on the fun. Collectively, the Scooting Seniors event. people. the group decided Monday Scooting Seniors will provide afternoon activities should be for information about the safe The Forever Young project shed people of all ages. One person operation of a mobility light on the many, many seniors said they would even bring their scooter as well as provide an in our community who are looking grandchild, to which the group opportunity to practice driving for engaging daytime activities to replied, “That’s great!” a scooter safely through a get them out of the house. Social course. Join us on Monday, engagement stimulates the mind What are the ideas for the new June 8 from 11 am to 1 pm, and is good for people’s health. As and improved Monday Fun Day beginning at Collingwood one community member shared, for all ages, you ask? Ballroom Neighbourhood House. The “I came three years ago and didn’t dancing, laughter yoga, cooking event will run outdoors on the know anybody. Now I love it and workshops, nutrition seminars, basketball courts in Gaston know lots of people.” various preventive health Park. Lunch will be provided seminars, trips to Steveston, to those who participate in the Another person said, “I live further Buntzen Lake and Bloedel event. FREE but please register away now but still want to continue Conservatory, picnics, painting, by visiting CNH or calling 604coming. It pleases me to no end!” bingo and more dancing! The 435-0323. cost will be $2.50 and include coffee/tea and a nice snack. You can pick up a copy of the monthly schedule from Every first Monday of the the friendly reception staff at month is FREE. We’ll be Collingwood Neighbourhood celebrating birthdays of House, 5288 Joyce Street, or the month with free cake, check it out online: http:// coffee and some dancing. If www.cnh.bc.ca/programs/ you want to stay for bingo, seniors-programs/ You can bring a small prize or $2. also call Kat, the seniors We keep playing until program coordinator, at 604everyone wins a prize or 435-0323 extension 227. She their money back! is currently looking for people who want to help host national We are really excited to Independence Day celebrations tell you about a fun event to honour various countries coming up on Monday, and introduce a variety of June 8: The Collingwood food and traditions to our Community Policing community. The following is a paid advertisement by Adrian Dix, MLA for Vancouver/Kingsway Congratulations, Gladstone! Led by Head Coach Todd Ablett, the Glastone Secondary Robosavages came in 6th, 7th, and 8th place in the VEX world robotics championships held in Louisville Kentucky. Huge Congratulations! There are now 33 countries with 12,000 teams and over 120,000 students directly involved in vex robotics. With only 25% of teams making the playoffs, and all competing teams having already won a state or national championship, our three Robosavages teams performed incredibly well! I am very proud to call myself the MLA representing Gladstone Secondary School. Housing Troubles? Our office has resources for both landlords and tenants on your rights and responsibilities, available in both English and Chinese text. Please stop by and pick one up. If you’re looking for housing or have recently undergone a difficult transition between residencies, please share your story with us. BC Teachers Institute The Legislative Assembly of BC offers BC teachers a professional development program at the Parliament Buildings in our provincial capital. The deadline to apply is June 30, 2015. Visit www.leg.bc.ca/bcti to apply online. This course includes a meeting with the Speaker of the House, MLAs, senior public officials, and a behindthe-scenes tour of your Parliamentary Buildings. Free Public Access Computer A reminder to those seeking computer access for social assistance applications, BC Housing files, resume creation or housing and job searches: I’ve set up a public computer in my constituency office with quick links to Ministry websites, government services, and community resources. All constituents are welcome to drop by during our office hours (Monday, from 12pm to 7pm, Tuesday to Thursday from 9am to 4pm, and on Friday by appointment). My Constituency Assistants are happy to help with any difficulty. Stay In Touch! My office, located on 5022 Joyce St., is currently staffed with two Constituency Assistants happy to assist with any questions or comments on any provincial or community issues, services or agencies. Please feel free to visit, call me at 604-660-0314 or send an email to adrian.dix.mla@leg.bc.ca. knowledge in the community as local residents share through food. They also build on its partnerships with other organizations working to build community and food security. One of the most important things about CNH’s food initiatives is that they create opportunities for local residents—long term residents and newcomers to Canada—to come together around common interests, engage in interesting and fun activities, develop understanding and friendships, and build connections. In this way, food becomes a catalyst for better integrating members of our society and developing a healthy community. For more information on CNH’s food security initiatives, visit http://www. cnh.bc.ca/neighbourhood­stuff­to­do/ foodsecurity/ To register for any food security programs at CNH, contact CNH’s front desk in person or by phone at 604­-435­-0323. 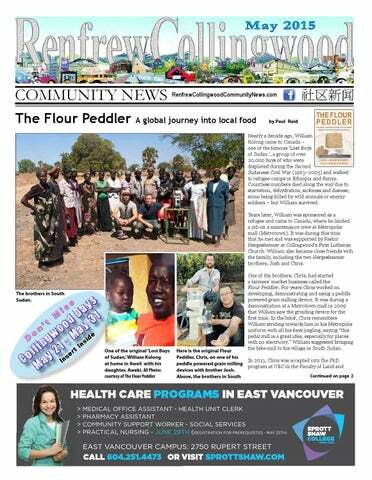 For questions on food security initiatives or to sign up as a volunteer, contact Stephanie Lim at 604-435-­0323 ext. 237 or Jason Hsieh at 604-435-­0323 ext. 225. Share the love: follow us! (5288 Joyce Street) and then join the parade marching over to CNH’s new site at Vanness between Ormidale and Boundary. (MOSAIC’s space will be a little further up the hill, on Boundary Road.) A First Nations elder will bless the site and then there will be speeches followed by the official ground-breaking. Everybody is invited to participate! Please bring a trowel, small shovel, sand shovel or even a big spoon. For the official groundbreaking everybody are welcome to pitch and then smile for the photographer to officially mark the ground-breaking for these new neighbourhood amenities. Afterwards, the parade will return to CNH for a light lunch. Please keep an eye on CNH’s website (www.cnh.bc.ca) and Facebook page (Collingwood Neighbourhood House (Official)) for updates and further information. Come join the fun on Saturday, May 23 at 10 am at CNH! Priority registration is given to siblings and those currently in the program. Forms will be handed out on the day of registration at 6:00am. If you are accepted into the class, an appointed time will be issued for you to return for the orientation, make payments and return completed forms. of the large family gatherings, overcrowded tables full of people laughing and talking, and marvellous grand meals. And when I say marvellous, I mean really marvellous. We were by no means a well-off family, but when it came to meals with my Poh Poh it was never short of a lobster or two. Poh Poh was widowed in her 50s when my maternal grandfather, Gong Gong, became sick and passed away when I was in about grade 3, so that would have been the early 80s. After that, Poh Poh was never quite the same. My memories also entail visits to three houses she lived in over the years with the family. A small red house in East Vancouver; then they moved to a larger mustardcoloured Vancouver special and, finally, a grand three-level house in South Vancouver. She helped her sons with their families when they went to work. She was a good and proud grandmother. Whenever we went for visits, Poh Poh always greeted us with a big smile. She was glad she got to see us all. It made her extremely happy when the whole family came together. The family gatherings during summer holidays resonate with me the most, as it meant her eldest son and his wife came out from Calgary with my two cousins. We would go to White Rock beach and collect mini crabs. Later, the few of us kids had our own mini crab derby races on the back deck of the house. Poh poh (in middle in the Chinese collar dress) had three daughters and four sons. deep down inside it was simply just that, like any parent, she wanted the best for her family. What I’ve learnt over the past year and half, while mourning and healing from the loss of my own father, is not to let the times that weren’t so happy and marvellous be what defines our memories. Inevitably, as people grow older, they change. Some happier, some wiser, some gentler and some lonelier. We don’t know their lifetime of private and personal experiences or struggles. Until we walk in the shoes of someone changing, aging, deteriorating and easing towards the latter part of their lives we will have no idea what it truly feels to have your loved ones pass, your body change, your mind clouded, your mobility restricted—to see your life pass before you.